TCU students wear their ‘black out’ shirts in support of Breast Cancer Awareness Month on the campus of Texas Christian University in Forth Worth,Texas. Throughout the month of October, organizations around the world have been involved in countless fundraising activities in support of Breast Cancer Awareness Month. Dedicated to increasing awareness of the disease and raising funds for research into its cause, prevention, diagnosis, treatment and cure, the annual health campaign is organized by major breast cancer charities internationally. 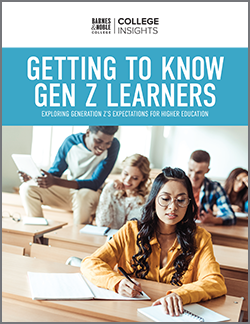 Yet, as the month of October draws to a close, that’s not a mission likely to end any time soon at Texas Christian University (TCU) in Fort Worth. 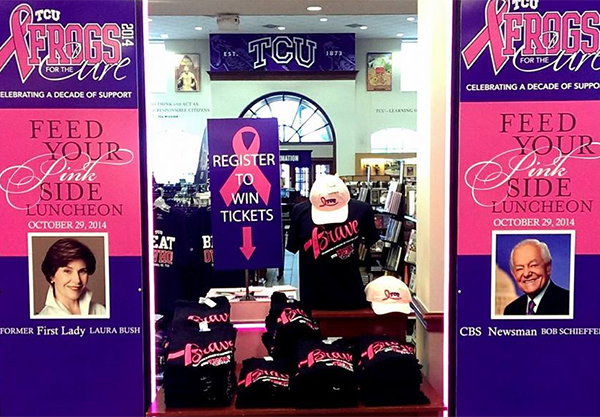 For the tenth year in a row, TCU Frogs for the Cure has been dedicated to supporting those with breast cancer through a year-round initiative, and one of the partners that helps with that effort is the Texas Christian University Bookstore. The organization began in 2004, when TCU athletics partnered with the Susan G. Komen, Greater Fort Worth chapter, to sponsor a first-ever ‘pink out’ halftime presentation at a university. Ten years later, that first event has grown to become a 180-member committee comprised of students, staff and faculty, community leaders and members of the medical community, with professional sports teams and universities across the nation celebrating Breast Cancer Awareness Month with pink-ribbon games to honor survivors. “It was really something that started out as TCU giving back locally to support a good cause, and it’s just grown from there,” explains TCU Bookstore Clothing Manager, Karen Skrasek, who also heads up the store’s involvement with the Frogs for the Cure initiative. 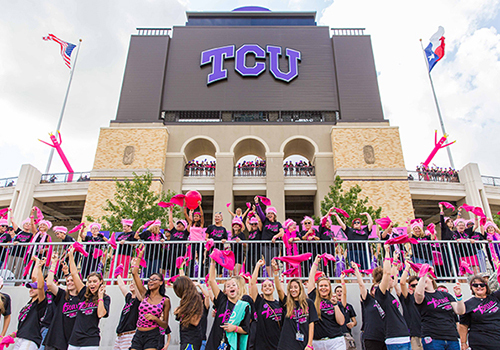 The song’s theme is also echoed in this year’s distinctive black and pink ‘Brave, TCU Frogs for the Cure’ t-shirt. 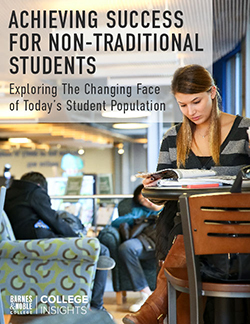 “We originally sold the shirts for $12 ten years ago, and the price hasn’t risen since,” says the bookstore’s General Manager, Derek Holbert. The TCU Bookstore donates $4 from each of the specially designed shirts to Komen, and they are also providing the wardrobe for the TCU’s Frogs for the Cure music video. A display in the TCU Bookstore in support of Frogs for the Cure. A percentage of proceeds from the sale of the t-shirts is donated to the Susan G. Komen Foundation, Greater Fort Worth Chapter. Breast Cancer Awareness Month closed out in style with a TCU Cure Gala and Concert. The event was opened by former First Lady Laura Bush and CBS News “Face the Nation” host, and former TCU alum, Bob Schieffer and his 9-piece Honky Tonk Confidential Band performed. During the Gala and Concert, the ‘Brave’ video had its premier and actress and singer Bernadette Peters performed accompanied by the Fort Worth Symphony Orchestra. To date, more than $250,000 has been raised in the last decade to support the Greater Fort Worth Affiliate of Komen because of TCU Frogs for the Cure programs. And even though this year’s Breast Cancer Awareness Month is coming to a close, at TCU, things are only just heating up. In addition to the funds generated by the t-shirt sales and other pink merchandise sold in the campus bookstore, booksellers proudly wear their ‘Brave’ t-shirts every Friday as the campus prepares for the big TCU Frogs for the Cure Football game on November 8. “This year, the plan will be to hold a ‘black-out’ game, with not only the survivors, but anyone supporting survivors wearing their black t-shirts and participating in the half time show,” says Skrasek. In the meantime, the bookstore staff will be attending football viewing parties and lunch events with the opportunity to sell as many additional t-shirts as possible. “We want to be a good partner and drive as much awareness and funding as we can for the Frogs for the Cure,” Holbert points out. “It’s a very special campus here, with some really great people dedicated in their support of finding a cure — and we’re just honored to be a part of it,” he adds.